The rusty hulk of the Costa Concordia began its journey to the scrapyard on Wednesday, after a two-year salvage operation off the Italian island where the cruise liner capsized two years ago, killing 32 people. Boats sounded horns and church bells rang as a tug boat slowly pulled the wreck of the liner, which was around two-and-a half times the size of the Titanic, away from the holiday island of Giglio, accompanied by a convoy of 14 vessels. Salvage workers gathered in bars at the port, drinking beer and smoking huge cigars, to celebrate after completing one of the largest maritime salvage operations in history. "It gives us great satisfaction, but obviously a measured satisfaction, a sober satisfaction, a satisfaction that cannot overshadow why we are here," Franco Gabrielli, the head of Italy's Civil Protection Authority, told reporters after the ship began its final voyage. 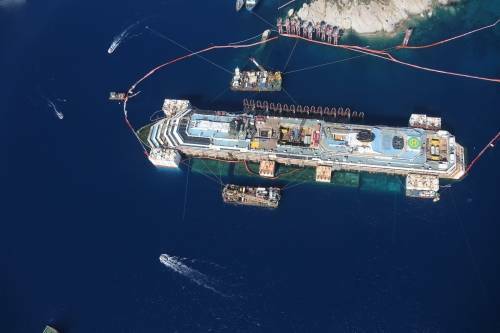 The 114,500-tonne wreck is due to arrive at a port near Genoa in northern Italy on either Saturday or Sunday, before being broken up for scrap. The once-gleaming white luxury liner sank off Giglio in January 2012 after sailing too close to shore. Despite intermittent bad weather over the past week, the salvage crews have slowly lifted the Concordia from underwater platforms by pumping air into 30 large metal boxes, or sponsons, attached to the hull. Franco Porcellachia, the engineer in charge of the operation, said on Tuesday that his team had done everything in their power to make sure the massive ship was structurally sound for the four-day journey. "Once we are in Genoa, then I can relax," Nick Sloane, the South African salvage master who has coordinated the operation, told reporters. The whole salvage operation is expected to cost the ship's owners - Costa Crociere, a unit of Carnival Corp - more than 1.5 billion euros ($2 billion), its chief executive said earlier this month. The wreck's departure removes both the physical remains, which prompted worries about pollution on the picturesque Tuscan coastline, and the visual spectre of a chaotic evacuation of crew and passengers, some of whom jumped ship and swam ashore. "At the beginning, this ship was a place where I saw tragedy strike, I saw death," said Italian Luciano Castro, a survivor of the tragedy. "Over time though, I thought this ship is also a place where a miracle occurred. It is true that unfortunately 32 people died, but also 4,000 people were saved." The ship's captain, Francesco Schettino, is fighting charges of manslaughter, causing a shipwreck as he tried to "salute" the port, and abandoning ship. During court proceedings earlier this year, the cruise company's crisis coordinator said Schettino tried to persuade him to pretend an electrical blackout had caused the wreck. One person who was on the ship when it sank is still missing. Salvage organisers have said the search for the body will continue once the Concordia has left Giglio. The ship was righted in September in a complex "parbuckling" operation in which the huge hulk was slowly lifted off the rocks. That took 19 hours and drew media coverage from around the world. The demolition and scrapping will be done by a consortium that includes Italian oil-services group Saipem and Genoa-based companies Mariotti and San Giorgio.